Ships today if you order in the next 13 hours 53 minutes. 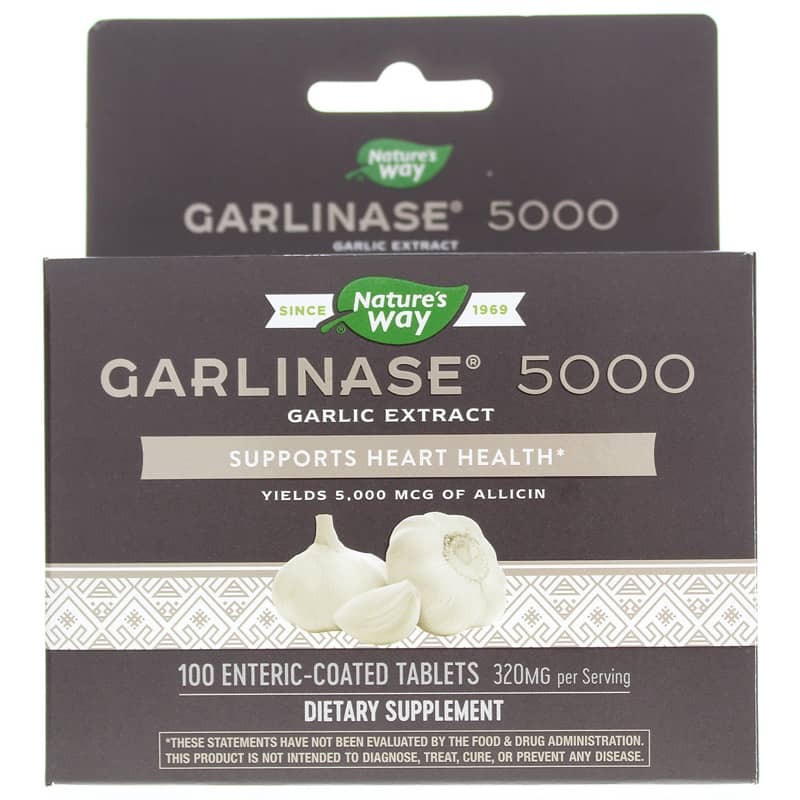 Garlinase 5000 (garlic extract) from Nature's Way, delivers 5,000mcg of allicin, the most beneficial compound in fresh garlic. Allicin acts as an antioxidant and helps support cardiovascular health. Enteric-coated tablets reach the small intestine, so you get garlic where you need it most and avoid garlic breath. Supports healthy cholesterol, naturally. Maintains healthy cholesterol levels that are already within the normal range. Nearly every clinical trial showing garlics support for heart health used fresh garlic extracts. Allicin is the key proven compound found in fresh, not aged garlic. Allicin acts as an antioxidant and helps support cardiovascular health. The Garlinase 5000 formulation reflects the considerable evidence that allicin is the most biologically active garlic compound. Formulated from a patented Swiss process, the enteric coating of Garlinase Fresh ensures that optimal allicin formation occurs. The unique slow delivery of allicin in Garlinase Fresh provides significant health supportive benefits. Other Ingredients: cellulose, sodium croscarmellose, hypromellose, titanium dioxide color, ethylcellulose, calcium stearate, silicon dioxide, glycerin, sodium alginate, medium chain triglycerides, oleic acid, stearic acid. Contains NO: gluten, sugar, salt, yeast, wheat, corn, soy, dairy products, artificial flavors or preservatives. Vegan. Adults: Take 1 tablet daily with food. DO NOT CHEW OR CRUSH. Do not use this product if you have a bleeding disorder, are taking blood-thinning medication, or are within a week of any surgical procedure. If pregnant, nursing, or taking prescription drugs, consult your healthcare practitioner prior to use. Keep out of the reach of children. Awesomeness in a pill. No back fire that garlic normally gives. Need a stronger dose though. Excellent product -and does not leave a garlic taste or odor to your breath.